He scored a 100 in a single game, he averaged 50 points per game in a single season, and yet his rival Bill Russell still finishes ahead. Chamberlain had no weaknesses, the guy almost led the league in assists because he felt like it. Arguably the most dominant player in NBA history, if you place your stock in individual numbers there’s a real case for Chamberlain to be higher on this list. Chamberlain’s shortfalls as a teammate have been documented, however, he still won twice. And we all know his trophy count would be much higher if he didn’t play against the most dominant team in history half his prime. Chamberlain obviously played long before my time, but there have been several people who did watch him, a few of whom spoke up claiming he was the GOAT during the proceedings of this project. The numbers are there. 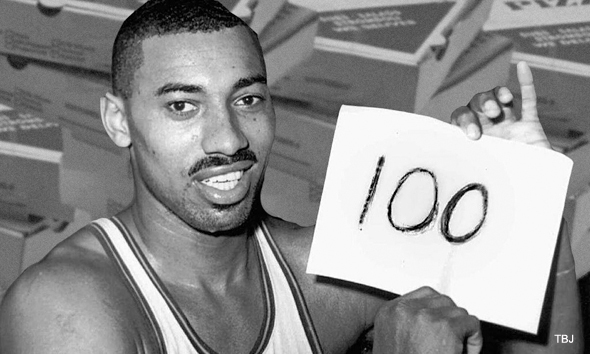 . .
Wilt the Stilt sits fifth all time in points and first in rebounds. His 100 points in a single game may stand forever, four-point line, or no four-point line. The Flag Bearer: Robert Littal (2). The Barn Burner: Justin Rowan (12). How did the other guys rank Chamberlain: Jacob Noble (3), James Holas (3), Justin Termine (3), Lang Greene (3), Will Reeve (3), Brian Geltzeiler (5), Matt Drappel (6), Shane Young (6), Josh Eberley (7), Adi Joseph (7), Justin Salkin (8), and Marc Griffin (11).